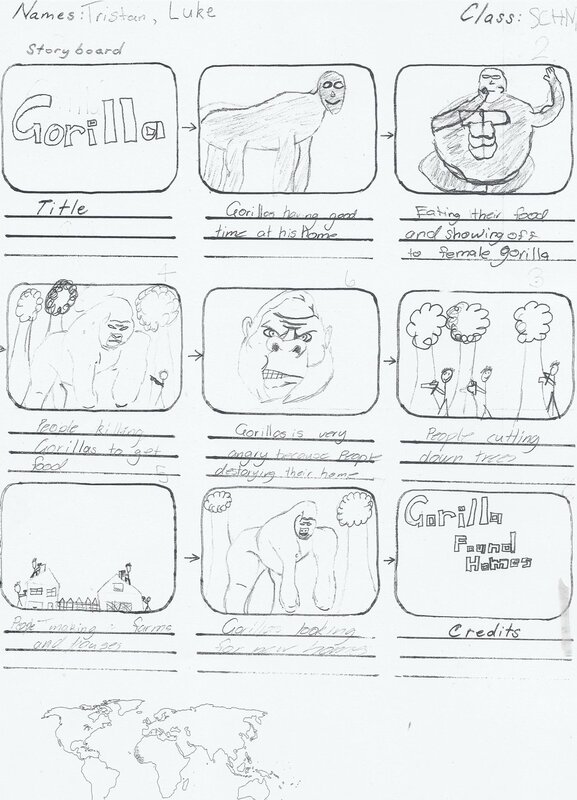 The new picture book by James Foley! The new picture book by Tohby Riddle! After three weeks of unpacking, shelving, unpacking, labelling, unpacking and even more unpacking, our new BER school library is almost ready for young, enthusiastic browsers. The students have been peering anxiously through the glass doors (removing nose marks has been a pleasant daily chore) and soon they will get a chance to see the treasures that await them. For one, I found my old “Where’s Wally” figure, a souvenir of a trip to the USA over Christmas 1991. 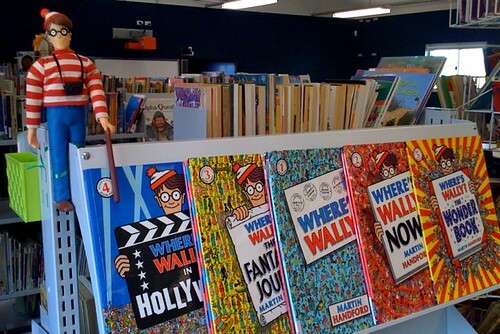 This Wally, er… Waldo (in the US) most often used to hang in a model hot air balloon in my previous school library, where I had originally made the stupid mistake of promising to “hide” him each week – but the students almost ransacked the shelves looking for him. In this new library, Wally will guard the sure-to-be-popular display of “Where’s Wally” puzzle books. … a library lion guards our new Returns box. A few weeks ago, I was upstairs in the seedy bargain section of a local bargain store, shopping for inexpensive picture frames – and located, instead, a sitting lion in a forgotten, dusty corner – in almost the same pose as the lion on the cover of the picture book. He was only $14, and the shop assistant said she didn’t even remember him being part of their stock. 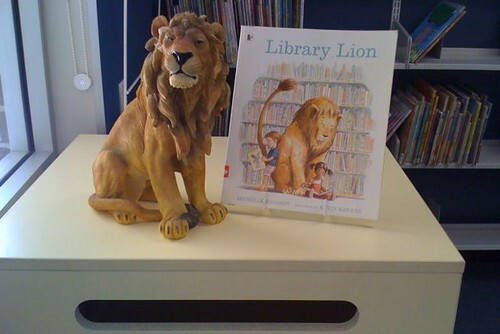 Thus, we now have our own library lion, and a smugly satisfied, bargain-hunting teacher-librarian.